"Jackson Katz is an American hero! With integrity and courage, he has taken his message--that the epidemic of violence against women is a men's issue--into athletic terms, the military and frat houses across the country. His book explains carefully and convincingly why--and how--men can become part of the solution, and work with women to build a world in which everyone is safer." "If only men would read Katz's book, it could serve as a potent form of male consciousness-raising." "This book leaves no man behind when it comes to taking violence against women personally....After reading this book you can see how important it is to be a stand-up guy and not a standy-by guy, no matter what race or culture you come from." 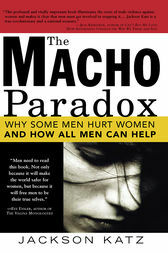 "These pages will empower both men and women to end the scourge of male violence and abuse. Katz knows how to cut to the core of the issues, demonstrating undeniably that stopping the degradation of women should be every man's priority." Jackson Katz is internationally recognized for his groundbreaking work in gender violence prevention with men and boys, particularly in the sports culture and the military. He is cofounder of the Mentors in Violence Prevention (MVP) program at Northeastern University's Center for the Study of Sports in Society. MVP is most widely used in college athletics, and is also used by both the 2005 Super Bowl champion New England Patriots and the 2004 World Series champion Boston Red Sox. Katz also directs the first worldwide gender violence prevention program in the history of the United States Marine Corps. His award-winning educational video Tough Guide, his featured appearance in the films Wrestling with Manhood and Spin the Bottle, and his nationwide lectures have brought his insights into masculinity and gender violence to millions of college and high school students. Since 1990, he has lectured at over nine hundred colleges, prep schools, high schools, middle schools, professional conferences, and military institutions in forty-three states. A native of Boston, he lives with his family in the Los Angeles area. For more information see www.jacksonkatz.com.